Product #1562 | SKU SFVVAS2 | 0.0 (no ratings yet) Thanks for your rating! Developed in partnership with VASST, the Vegas Pro Production Assistant plug-in enhances the functionality of Vegas Pro software with a set of batch processing and workflow automation tools. 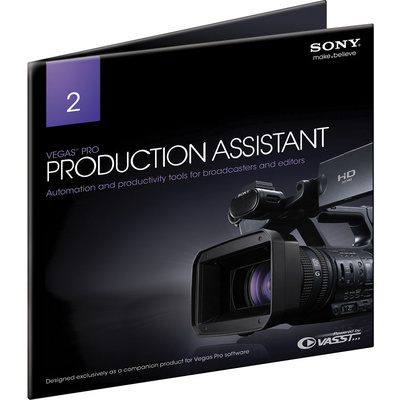 The Production Assistant plug-in automates many frequent tasks and processes to save hours of tedious editing work. And, with a complete set of Video Turtorials to help you get started, it's easy to use. The Vegas Pro Production Assistant plug-in includes tools to automatically insert crossfades between clips, add and customize lower thirds, and create photo and video montages from your media. Setting up a Vegas Pro project as a template—with your regularly used titles, lower thirds, credits, and empty placeholder events – is a powerful way to save time on repetitive tasks. The Production Assistant takes efficiency to a whole new level. Simply select the media you want to replace your placeholder slugs, click to process, and voila! Your project is ready to go. With project templates, you’ll never have to start with an empty project again! Batch processing in the Vegas Pro Production Assistant goes well beyond your run-of-the-mill media encoders. You can select multiple files, multiple output formats, and walk away while Vegas Pro and the Production Assistant output every format you desire. But what really sets the Production Assistant apart is the ability to treat multiple files with processes such as image overlay, aspect ratio convert, broadcast color correction, normalize audio, reduce interlace flicker, adjust playback rate, and more. Imagine being able to insert a card into a card reader and walk away, never touching the application until after a finished video file is complete! With Vegas Pro Production Assistant a template can be specified which allows a project to be completely hands-free from card insertion to final output. Insert a memory card, and Vegas Pro Production Assistant 2 will auto-transfer content to folders on your hard drive. This process ensures that all of your footage, along with everything Vegas Pro needs to open your files, is transferred successfully from the memory card to your machine.